I’ve always loved the look of gabion walls – the subtle variation in stone colour, the texture of different rock fillings and the light and shade of stone and crevice. They’ve been around for a while in road building and industrial landscapes, but when I went to try and find out how to build a small one for myself, I found information was pretty sketchy. 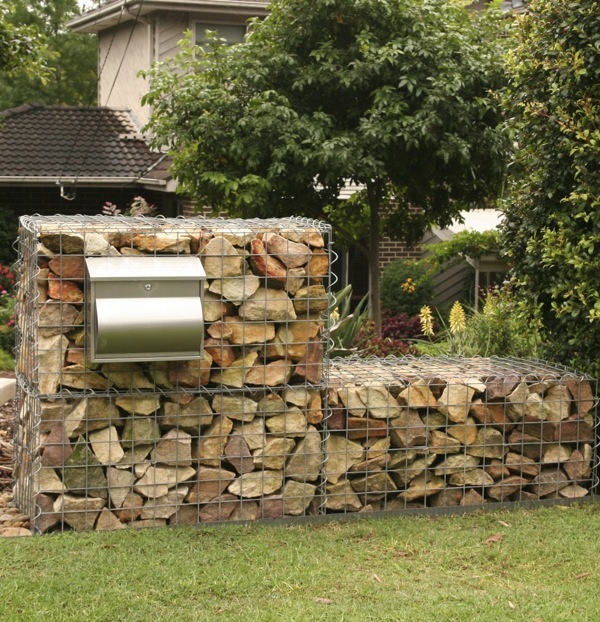 I didn’t want to build a retaining wall, just a small free-standing gravity gabion wall about 1m (3 ft) high. It all started with the letterbox. We’ve had bad luck with letterboxes. The lovely wooden house-style one made by my dear old dad was kicked apart some years ago by drunken football fans, and the repaired version was stolen. We ended up with a small metal letterbox sitting on some concrete blocks for a couple of years while we landscaped the front garden. Serviceable but pretty embarrassing! I decided I wanted something really, really solid, so a wall-style box fitted to gabion wall at postie-preferred height became my plan. 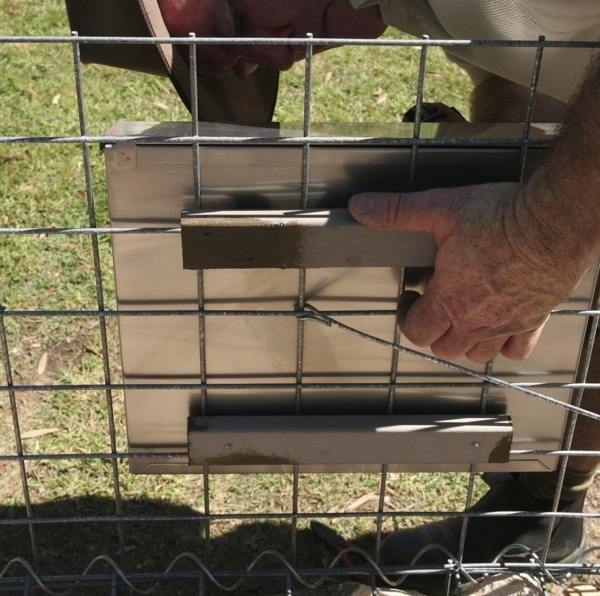 First we had to find how to make a galvanised mesh cage to holds the rocks. 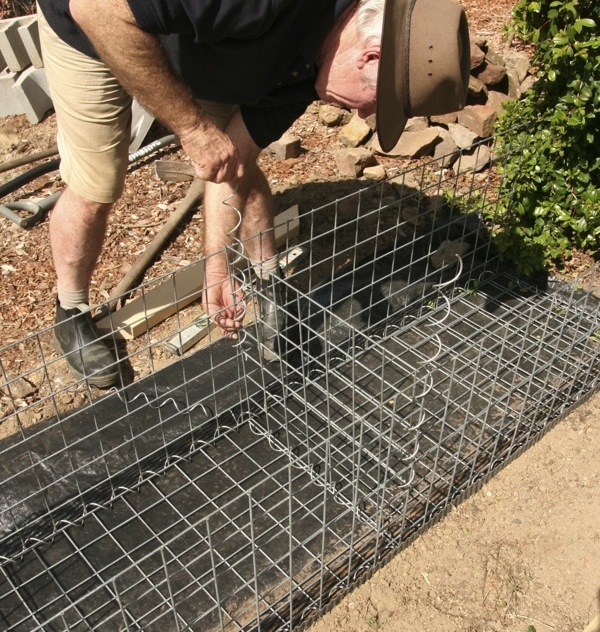 Luckily, in Sydney we found Permathene P/L, which makes kit form gabion cages in a variety of sizes. Their gabion cage mesh is coated with Galfan (aluminium 5%, zinc 95%), a longer-lasting material than plain galvanising, and the aluminium in the coating will weather to a lovely grey patina. We chose a stepped design that used a 2m x .5m x .5m (6ft x 20inch x 20 inch) base layer, topped with a 1m x .5m x .5m (3ft x 20″ x 20″) second tier. Total cost – $200. We used a hoe to level the pad area on the front boundary. The ‘soil’ here, if you could call it that, is close to the consistency of concrete so we were able to put our gabion wall on what’s there. 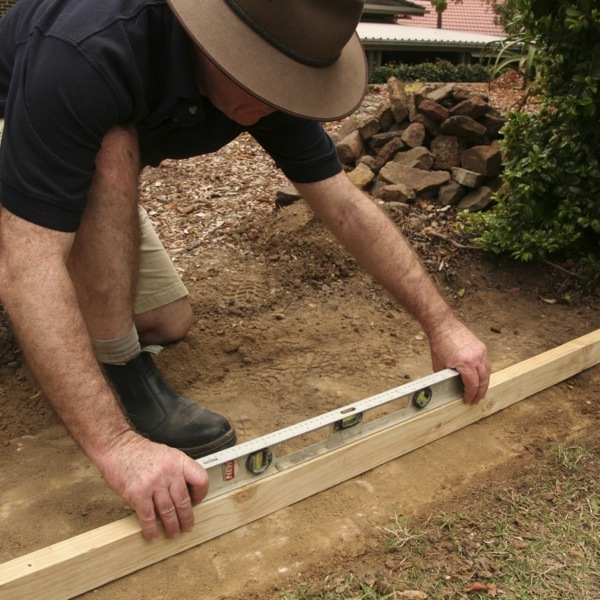 If you have slippery clay soil, you will need to replace about 150mm depth with a compacted gravel or road base layer to make a stronger support, or otherwise the soil might slump under the weight. Then we used a level on a long straight-edge to check the pad was level in both directions. As our gabion wall sits along our front boundary, I wanted to make sure that the couch grass on the nature strip couldn’t get up into the wall, from where it would be impossible to remove. I’ve seen a couple of sad-looking gabions where that’s happened. We used some powder-coated, corrugated 100mm (4 inch) edging we bought in a roll from Bunnings Hardware. 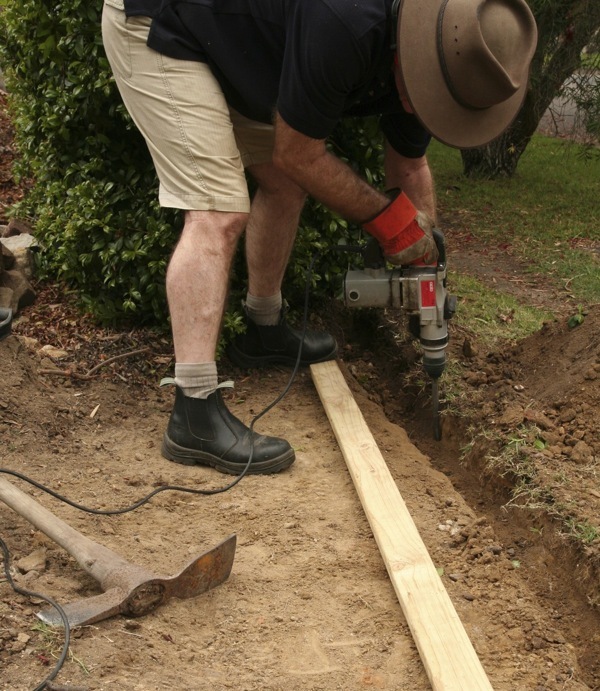 The soil was so tough that we had to use an Ozito demolition hammer to cut a trench for the edging. We spread weed mat over the pad and tucked it down tightly behind the edging, using a length of in-ground treated pine to push it straight. We started by laying the mesh sheets out flat with the base surrounded by the four sides. Our cages are held together with a spiral of gal steel that you wind through the adjacent edges of the mesh panels. It’s easy to do as the spiral exactly matches the mesh grid. When it reached the end, we used pliers/multigrips to pinch each end of the spiral so it can’t slip out. Our 2 metre (6ft) long lower cage has a middle cross panel to stop it bulging out, which we wired in along its bottom edge when the cage was open on the flat, and then down each vertical side when we had the cage in place. The cages have bracing ties across each corner about half way up which we positioned and pinched closed. We have a lot of on-site sandstone which we broke up into smaller pieces with the Ozito demolition hammer. Filling with onsite materials also means the gabion wall fits really well into its surrounding landscape. Each piece has to be about 150-200mm (5″-8″) in 2 dimensions and 100mm (4″) thick. Tony worked out a clever system using the diameter of old plastic pots – if it went through the 200mm (8″) width but not through the 100mm (4″), it was the right size. After calculating we wouldn’t have enough broken rock, we decided to re-use some leftover concrete blocks and old bricks for bulk in the centre of each cage. Packing the rocks takes some time. The sandstone varies in colour through white, yellow, pink and brown and I wanted to mix up those colours. I also looked through the broken rocks to pick out those with a flatter face so I could put them on the presentation street side. Corners are trickier, and we learned to put aside pieces with a natural right-angled corner so they’d fit nicely in both dimensions. We worked in layers, using rejected smaller pieces to fill up any voids and to wedge the best rocks against the face of the cage, tessellating them as closely as possible, and then filling in behind them to hold them in place. Once we’d packed (and then repacked in a few spots) the lower cage, we wired on its lid and then assembled the second layer on top. Before we packed the second layer, we attached our new brushed steel letterbox in place using two timber backing pieces. We filled the second layer like the first, using some old bricks and blocks in the centre. I found I needed to get down low to check that I’d tessellated the pieces carefully enough that you couldn’t look through to the central blocks, and I made sure to leave some really good looking pieces for the top layer. I’ve seen gabions that are personalised with found, or site objects, (like those in Ballast Point Park) but Tony thought that idea was a bit kitsch. However, when we’d finished, I realised I’d lost an earring, so it’s in there for keeps now! With the second lid wired on (after a fair bit of my fussing about and repacking some sub-standard areas), we were finished. We’ve had many people stop as they walk by and admire it since. And I’d like to see some ratbag try and kick this letterbox over. Just curious about the gabion walls in this post, can you use them in beachfront applications? Also where do you get the mesh to make the cages, any hardware store, and what gauge mesh is recommended? Thanks for that, appreciate the help. “It will depend upon whether the gabions will be in direct contact with salt spray. Generally if it is just near the coast a Zn95 Al5 (our standard Galfan) will suffice. We also offer a higher Al content of 10% (Zn90 Al10) for extra protection. We have supplied some projects in coastal regions with this mix. It gives the best performance of any of the metals apart from stainless steel. If the product is right on the coast and is hit by waves then the very best protection is a Galfan (Zn90 Al10) with a HDPE coating over that. This will ensure maximum protection. I’ve started to demolish an old wire and wooden fence, You know the kind of old fashioned mesh that is pulled tight when its on the fence but compacts when it goes loose. Its not rigid like gabion wire but do you think there would be a way to support it while filling it as a gabion to make small walls around new gate posts and letter box. I would really like to reuse it instead of sending it off for recycling or committing it to landfill. Its survived as a fence for over fifty years and the metal mesh still looks really strong. I reckon if I sprayed it with Galmet and could support it while filling and putting the top on, it would go another fifty years. Anyone tried this? I’ve seen the walls in ballast park to and I’ll be putting in some found objects for sure. Hi Frances – I love the idea of reusing materials wherever possible but I don’t think what you have will work for this purpose. 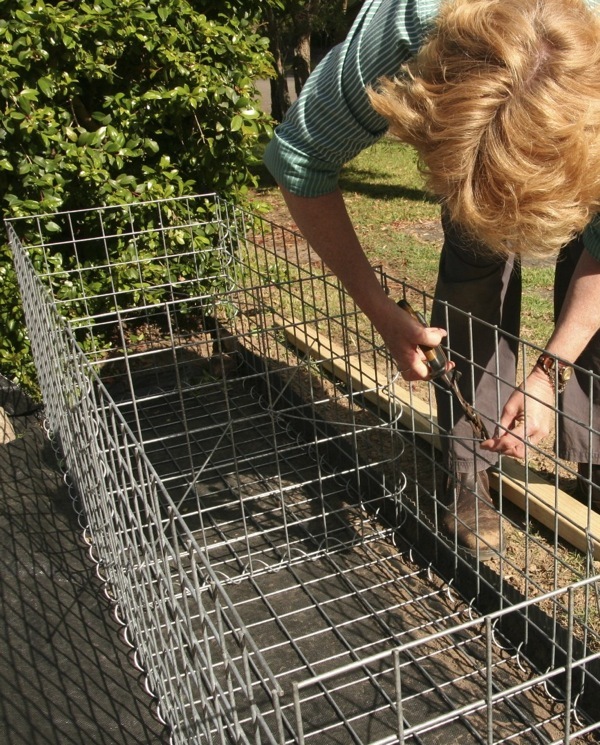 The gabion cages I used are quite strong and rigid and they still bulged out a little as I filled them with rocks. 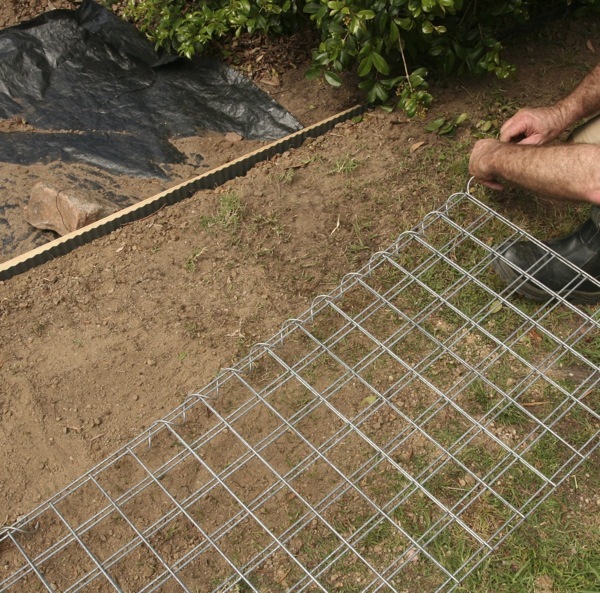 I think that the wire mesh you describe would just bulge out and slump wider and wider as you filled it. You could try with lots of criss-crossing tie wires between the side panels but that would involve buying lots more wire, which kind of defeats your reuse purpose. The only possibility I can think of would be to use it as your bottom and top layers and buy some rigid mesh panels for the sides, although the top would not look smooth then, but probably a bit lumpy/undulating. Hi, I actually really like the letter box, would you mind sharing where you found it? Thanks. Hi Lisa & Ian – fantastic, your wall sounds wonderful. 20m is a hell of a lot of rocks so you must be feeling pretty fit! I’d love to see some photos – please email them to info@gardendrum.com if you can. And yes – agree on the added wildlife habitat. Super information! Thanks for laying out your sourcing/strategy in such detail. (You’re the 1st person I’ve ever hear use “tessellation” in a description of their garden). Now I’m filling all the gabion cages for our curved gabion wall, tessellation has come to rule my life. I interlock things everywhere I go. You should see the breakfast table. Great post – thank you very much for the detailed info, photos and tips!! Your “How to” instructions have given our small community group greater confidence to DIY a low gabion wall as part of our future ‘community parklet’. That’s great to hear Tanya! Would love to see some project photos (send to info@gardendrum.com) and if you need any more advice, just let me know. Are you a manufacturer of gabion box? Only do welded gabion for decorate? 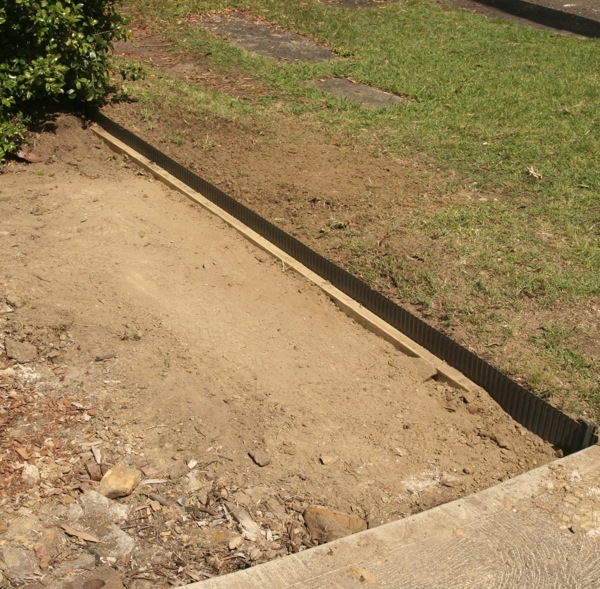 How about protection using retaining wall? Hi Jessie – GardenDrum is an information site only, and doesn’t manufacture or sell any products. I just love the internet… I totally stumbled (and I’m so glad I did) across your post while reading a different post on how to build a shed using recycled pallets. They incorporated a 1/2 gabion wall (which they filled with demoed/recycled concrete chunks), but they didn’t go into any detail on the wall, so I did a search on ‘gabions’ and your post popped up. So, thank you for all your detailed information!!! Together with the detailed info I obtained about the shed, my head is just swirling with ideas to start another project. Hi Dereen – great to hear from you and I’m so pleased you’ve found GardenDrum helpful. I’d love to see some photos of your gabion and recycled pallet projects (info@gardendrum.com) and if you’ve got any questions, I’ve been doing a lot more gabion work this past year, so ask away! 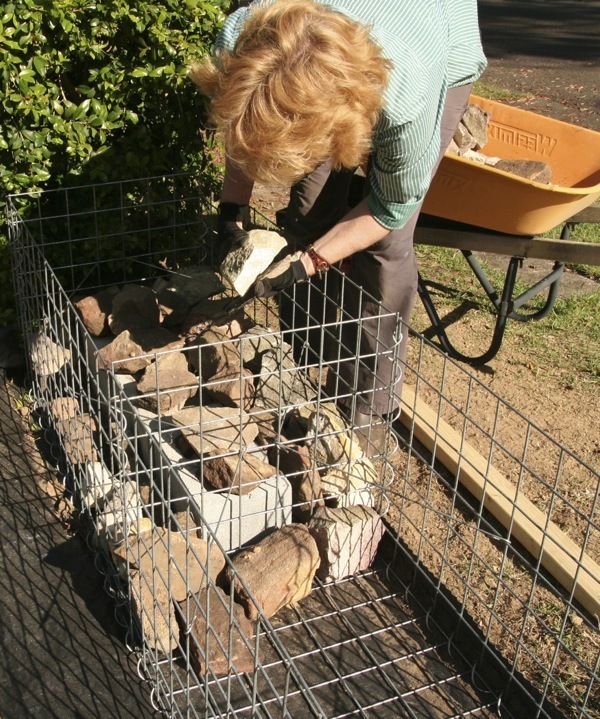 My main advice is that, if you’re a ‘picky packer’ like me, allow plenty of time for your gabion building. Please excuse my ignorance – do you ever take the cages off or they are there for good ? Hi Elke – the rocks inside the gabion cage are not self supporting so yes, they have to stay caged. If you didn’t want cages, then you’d have to build a proper dry stone wall which takes a lot of skill as every piece has to fit perfectly with its neighbour so they all lock together. Hi Wade – the base layer of my gabion letterbox is 2m long by 0.5m x 0.5m, and then the upper layer is half that length – 1m x 0.5m x 0.5m. The whole structure is 1m high. 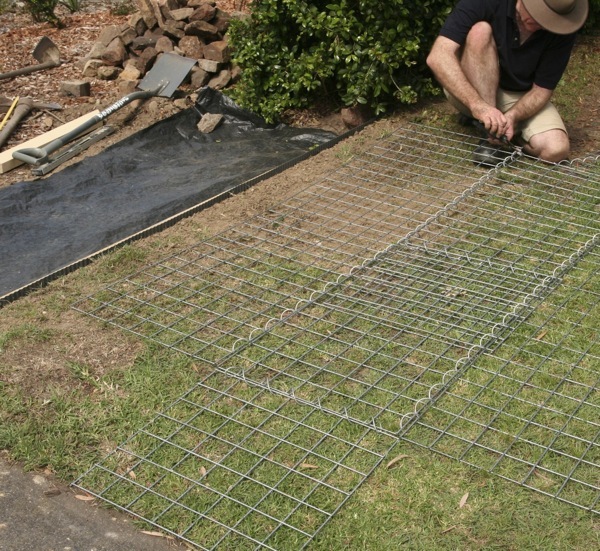 We bought the gabion mesh cages in kit form from Permathene in Sydney. Mrs Stewart, I have a tough hill behind my house in Alaska USA. After listening to you I went to the local hardware store and was able to find what I needed and am now under way to having a flat back yard, thank you. 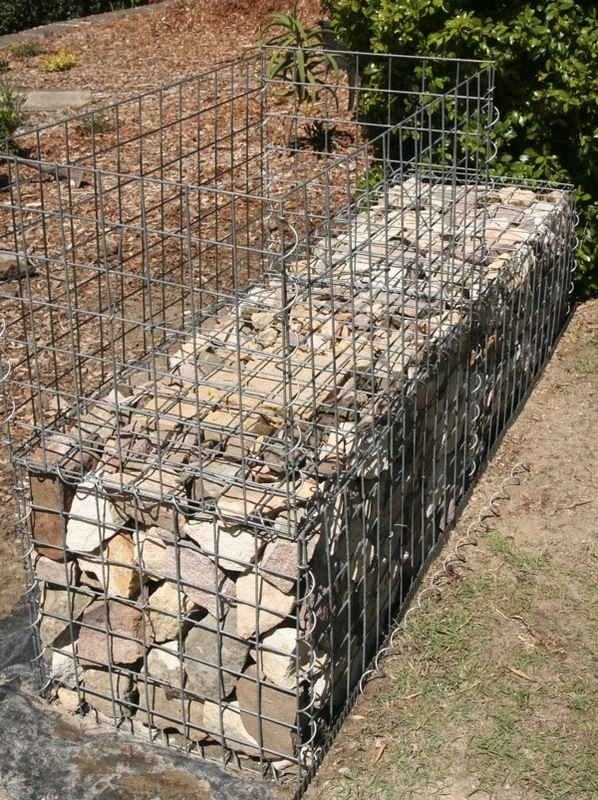 This is a great DIY gabion project! My crew and I have been building custom walls, water features, letterboxes, garden lights and even furniture, inspired some years ago by your article. We now build fully-engineered bespoke gabion features all over Melbourne, which is really a lot of fun, and an inspired success for us at Into The Wild. Everyone here at Into The Wild would like to thank you and offer our assistance on future projects! A lot of work!! Looks realy good,.but I don’t think I’d try that project. Good luck. Hello, I’m Saad from Saudi Arabia, how do you get them and how much the cost of the unit and the total length? And the duration of their arrival? Hi Chediel – I’m sorry but I don’t design gabion walls. This wall was made using kit gabion mesh cages bought from a supplier. Huge help with the illustrations and guide, much appreciated. You’re welcome Joe. Gotta spread that gabion love. Hope your wall works out well. 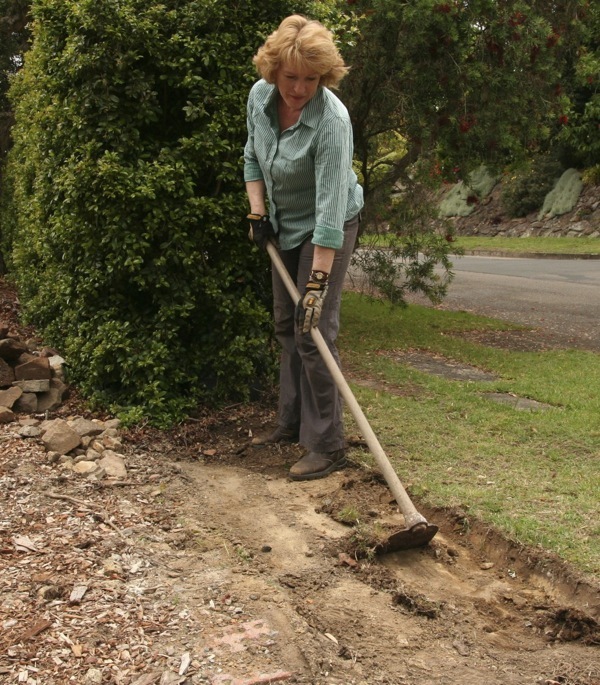 Hi Catherine, do you have any advice on how to calculate how wide a gabion fence should be, relative to its height? We are planning a fairly high fence and I’d like to make it a gabion style, but don’t want to risk it falling over. Thanks. Hi Vanessa, ‘fairly high’ is a bit vague for me to be able to offer advice on this and it also depends on whether the gabion fence is also on a slope, and the strength and stability of your soil. The short answer is that gabion cages don’t offer much structural support so the taller the wall, the wider the base will need to be, just like a dry stone wall which has a batter from its base to its top. The gabion manufacturers will be able to give you more accurate advice.